Does Treated Deck Wood Shrink? Also known as Brazilian walnut, ipe is an exotic lumber from South America that is well known for its strength and resistance to the elements. Due to the wood's many positive attributes, some homeowners have begun using ipe as an alternative to more traditional decking materials, such as pressure-treated lumber and western red cedar. However, the wood does have some disadvantages. Ipe decking material is one of the strongest wood decking materials available. While western red cedar has a bending strength of 7,500 pounds per square inch, or psi, and pressure treated lumber has a bending strength of 14,500 psi, ipe has a bending strength of 22,560 psi. In terms of a deck, the high strength of ipe means the deck surface will be able to hold greater quantities of weight without succumbing to structural failure. In addition to being strong, ipe decking material is durable. This durability stems from ipe's wood fibers or grains, which are packed close together, making the wood's surface especially hard. This dense grain pattern and resulting hardness mean that ipe decking material is not susceptible to scratching or dents, which are imperfections that can disrupt the aesthetic nature of other decking materials. 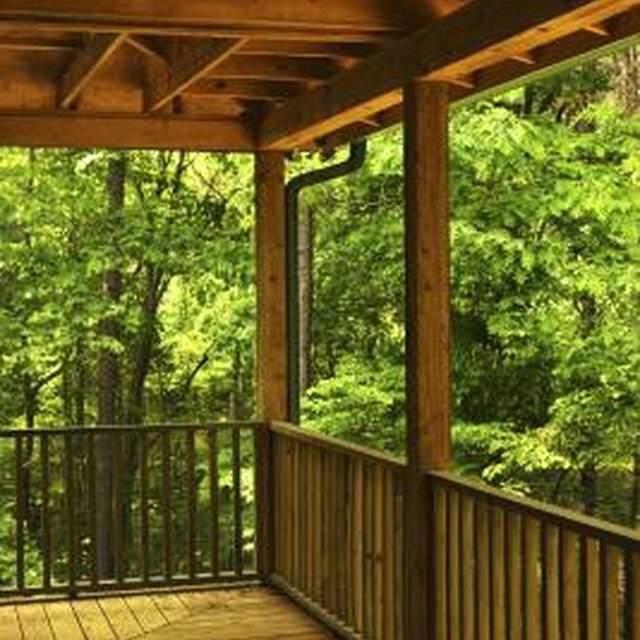 Ipe lumber is well-suited for outdoor construction. The US. Forest Products Laboratory rates ipe as being able to withstand the damaging effects of insect infestations and rot for 25 years or more. In addition, ipe does not succumb to moisture or weather-induced problems, such as checking, twisting, shrinking, cupping or splintering. And while termites and fungi pose little threat to ipe decking materials, marine borers can cause damage. Marine borers are small crustaceans and mollusks that bore through wood. So if you are building a deck close to an ocean, estuary or marsh, ipe may not be the best option. Building with ipe decking material has both positive and negative aspects. On the positive side, ipe accepts nails, screws and other fasteners without succumbing to splitting or cracking. In addition, ipe holds fasteners securely in place, so you don't have to worry about them becoming loose or popping out. On the downside, ipe wood releases a fine yellow dust when sawed, which can cause allergic reactions in the respiratory system and skin. The cost of ipe decking material will vary from location to location. However, as Woods the Best notes, a typical price range is between $5 and $7 per foot of board. In comparison, you can typically purchase western red cedar or pressured treated lumber boards for $2 per foot. So if you are building a deck on a budget, ipe is not the most economical option. Woods the Best: Ipe as a Deck Wood?